M51 Fishtail Parka in Black. This is an excellent reproduction of the now hard to find originals. It is hard to tell the difference between the two. The main difference is that our reproduction has a storm cuff which is a great addition and one you cannot even see from the outside. We have never seen a better copy and it is only available with us in the UK. Sized very large please ask for sizing advice if unsure. 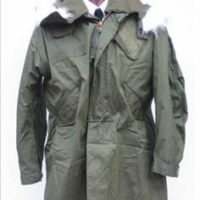 Hello !, I’m interested in m51 fishtail parka black. For a chest girth 117 cm (45 “) and a height of 181cm, which would be the right size? Hi Cristina, thank you for your message. Grateful if you could e-mail your question please to info@jumpthegun.co.uk thank you, Jonathan.